A concise, engaging, yet somewhat limited introduction to a thematic hot potato. Wie beeinflusst die Digitalisierung unsere Lese- und Schreibgewohnheiten? The volume grenzlinien. 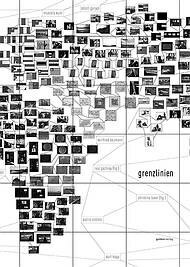 von grenzen, grenzüberschreitungen und migration encompasses a series of intimate stories, specialists’ reports, and abstracts from theoretical writings, framed by the different art projects that run like a thread through the book and reflect further ideas in the form of photographs, sketches, map collages, and screen shots. A series of intimate stories that at times read as diary entries are spread over the volume. For example, in the grenzlinien + knotenpunkte (28-30), raul gschrey draws attention to the specificities of European countries' restrictive visa politics to which migrants are subjected. He describes how border officers in Malta are struggling with identification practices of the asylum seekers, who, after hard journeys, are most likely not to have any identification papers on them. Therefore, local border enforcement agencies invite linguists who are able to identify language patterns and dialects to reveal the true heritage of the people arriving on the island. Such practices make it much more difficult to fake one’s background from a conflict zone to gain asylum. Similarly, other modern technology – such as fingerprint analysis – is used within UK border control practices. As personal accounts illustrate, in order not to become a part of the system, some informants burn their fingers to eliminate their identification and stay out of the system. Such stories are presented in a very intimate, guileless manner, so one can directly sympathize with the uneasy and sometimes shocking solutions that migrants come up with in order to overcome official control practices. Some of the other personal portraits surprise for their detailed, almost phenomenological accounts of border crossing. At times it reads like a handbook of do’s and don’ts for potential illegal migrants who want to cross borders and one is genially concerned for the health and future of those brave, sometimes terminally brave men and women. A series of specialists’ reports complement the vividly presented personal experiences. For example, norbert wagener (140-145) reports on his over 40-year career as a lawyer specializing in illegal immigration and ways of legalizing it. In his reflection he refers to boundaries as geopolitical lines that have been always crossed and describes new creative ways to overcome the strictness of the rules that are protecting the status of those boundaries. When such strong opinions about the creative power of migrants collide with the vivid examples of the powerlessness of others (e.g. sitting in the woods in Northern Africa hoping to find a right moment to escape into border camps), one becomes aware of the ambiguity of the ‘border crossing’ notion. Another contributor, the activist karl koop (146-147), provides an intriguing comparison of smugglers who helped Jews to escaped Nazi Germany and people who facilitated escapes from the DDR to the current situation of people organizing boat trips and support groups for migrants willing to come to Europe. Such historical links refreshingly put the notions of border crossing in perspective, taking the reader from the expected EU border policy mindset and forcing one to rethink one’s perspective on heroes and criminals. Furthermore, tom holert + mark terkessidis (152-157) report on the architecture of social death. While looking at the infrastructure of the deportation centers, authors specializing in Visual Culture studies discern the implemented 'Regime of Waiting'. The concept refers to the imposing threat of the unknown, which ultimately results in elimination of hope among migrants, turning them into ‘social zombies’. The provisional architecture of some of the constructions related to border crossing is reinterpreted as the strong symbolism of the unwanted, signifying the end of the political subjectivity of migratory subjects. These diverse observations are framed in short theoretical inferences, guiding readers’ thoughts in different directions. In the same way, the introductory essay grenzlinien by christine taxer + raul gschrey (16-24) suggest borders to be social constructions, and ultimately negotiation processes of belonging and exclusion. marc wrasse (121-124), on the other hand, refers in his abstract to Hegel and his ideas on borders and the embodiment of foreignness that is already inside of us; as well as to Foucault, who is ontologically questioning the possibility of the borders to start with. wolf perina finally questions if there is there such a thing as ‘a right to cross a border’ and why some people are denied it. All in all this puzzling multiplicity of impressions on border crossing is framed by the art projects, in which such personal dramas and power struggles are touched on only indirectly. The art projects and exhibitions, which are at the heart of this collaboration, do best what they are meant to be doing – they bring uncertainty into one’s perception of personal knowledge about migration and border crossing. These projects are clever exaggerations of certain aspects of the processes that are brought to the abstract level: wrecked boats are photographed in a catalogue format, performances of raising a symbolic nautical ‘man overboard’ flag are recorded, and maps are redrawn to disorder the geographical borders. This disordered array of impressions and ideas, that one could broadly relate to situational geography, has multiple implications and productive effect; yet it is up to the reader to make the necessary connections and come to the conclusions that will impact one’s knowledge about borders, border crossing, and migration in general. Taxer, Christine und Raul Gschrey (Hg. ): grenzlinien. von grenzlinien, grenzüberschreitungen und migration. Frankfurt am Main: gutleut verlag, 2013. 192 Seiten, zahlr. Abb., kartoniert, 25.00 Euro. ISBN: 978-3936826586. Das Buch ist eine Sammlung von Reisenotizen, Tagebüchern, Meinungsäußerungen von Aktivisten, Eventberichten und enzyklopädischen Zusammenfassungen über die Grenzverwaltung beteiligten Organisationen. Es ist eine Art faszinierender Zwischenablage mit Aufsätzen in einem 'lockeren' Format und einer maximalen Länge von fünf Seiten. Dieses Buch verweist auf die Vielzahl von Ebenen, von denen aus die Themen der Grenzen und Grenzübergange angegangen werden könnten. Man könnte dieses Buch dem Gebiet der Situationsgeografie zuordnen, welche den Zusammenhang der Interaktion von menschlichen und natürlichen Einflüssen mit Blick auf verschiedene Standorte untersucht; in diesem Fall – die Grenzen. Diese einzigartige Mischung bietet den Lesern die Möglichkeit die grenzbezogenen Themen zusammen zu denken, die ansonsten vielleicht nicht in einen Dialog miteinander geraten wären. Eine spezifische Analyse dieses Netzwerks von Ideen ist allerdings nicht vorgegeben, so dass der Leser aufgefordert wird, das Verbindende selbst zu entdecken. Ohne ein tiefgreifendes theoretisches Fundament, basiert dieses Buch vor allem auf persönlichen Erfahrungen, Kunstprojekten und pointiert politischen Statements der Autoren. Es ist eine aufrichtige Einladung das Potential des Themas zu erkunden, gleichwohl angeregt durch die Kritik an den bestehenden Systemen bzw. dem politischen Zustand der EU-Grenzverwaltung.